By Dennis W. Viau; modified from a dozen recipes. Virtually unknown outside of Utica, New York, this dish is a variation of the many Italian-American versions of macaroni and sauce. 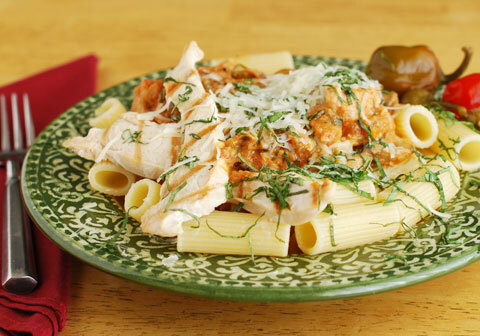 This is made with chicken breast and roasted peppers for a Southern Italian, Sicilian flavor. The name comes from rigatoni, the pasta used in this meal. The dish’s popularity led to an annual cook-off, Riggiefest. The best way to make this is with the freshest ingredients. 4 ounces (113g) fresh mushrooms; sliced (cremini are customary, but shiitake are good too). Heat the oil and butter in a skillet and sauté the mushrooms until tender and slightly browned. Remove from the pan and set aside. Sauté the shallots until lightly caramelized, 5 to 6 minutes, adding more fat to the skillet if necessary. Add the minced garlic. Cook 1 minute. Then remove from the heat and set aside. Heat chicken stock in a heavy saucepan until boiling. Lower the heat and simmer until reduced to about half its original volume. Add the cubed chicken, bring to a boil, cover, and cook the chicken only until it begins to look thoroughly cooked. Cover the pan and remove from the heat. Set aside. Slice peppers into long strips, discarding the seeds and white membrane. Sear on a hot griddle (500°F/260°C) to add dark bar marks (black marks will add a smoky flavor) or roast in the oven until tender and lightly browned. Let cool, then chop into ¾-inch (2cm) pieces. Set aside. Boil the rigatoni according to package directions, until al dente. Drain and return to the pot. Dress with a little olive oil or butter. While the pasta is boiling, grill the chicken strips on a hot (500°F/260°C) cast iron stove top griddle (or in a hot skillet) to brown with bar marks. Turn and cook the other side only until thoroughly cooked without overcooking. The chicken strips could also be browned under a broiler. Do not overcook. Plate the cooked pasta (either individual servings or in one large bowl) and ladle the sauce mixture over the top. Drizzle the extra virgin olive oil on top. Garnish with any combination of the garnish ingredients above. Place 1 or 2 grilled strips of chicken breast along one side. Serve immediately.